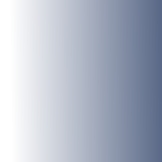 Settle SD 820634 – Large pay and display cp. 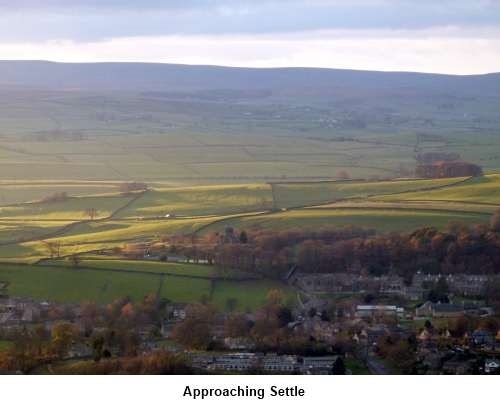 OL2 Yorkshire Dales Southern and Western Areas. 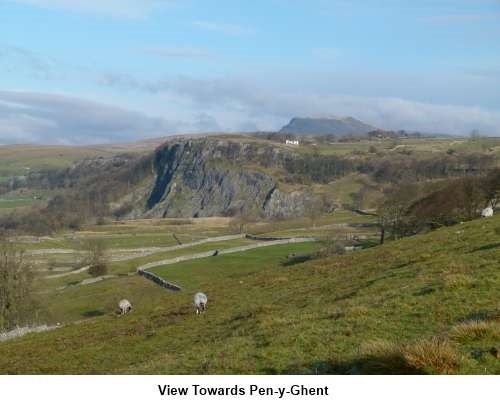 Introduction: This is a lovely, easy to follow walk from Settle which shows off some magnificent limestone scenery, the impressive waterfall Catrigg Force and the large Victoria Cave. 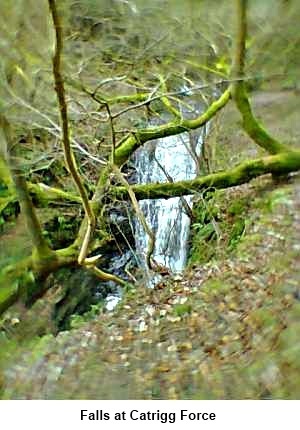 It is very similar to my Settle Round but adds the waterfall which is especially impressive after heavy rain. 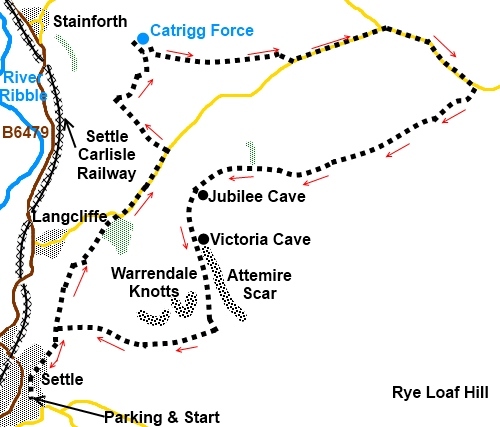 This walk starts from the large car park in Settle (SD 820634). To find this, turn east off the B6480 in the centre of Settle along Chapel Street. At the little crossroads, turn right along the narrow road Chapel Square which leads to the pay and display car park. Charges are modest and there are handy benches to put on boots. Start: Walk back along Chapel Square, straight across the small cross roads along High Street then turn right up Castle Hill which joins Constitution Hill (before becoming "Highway"). Watch out for the fork at a telegraph pole. Highway branches left and you want the broad track on the right (SD 822638). 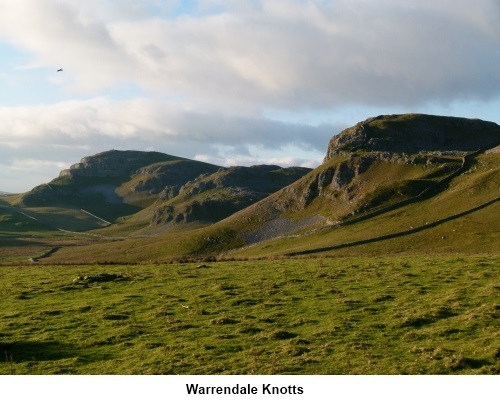 Follow this track as it gently climbs and there are some magnificent views back over Settle. Follow this track for half a mile towards Langcliffe, ignoring the first track you come to on the right (SD 823641) which climbs steeply and will be your return route. You will soon have good views of Pen-y-ghent straight ahead. At the next fork (SD 824646) bear right. This junction is easy to miss as the better used track descends to Langcliffe. As a guide to where to branch off, look out for a group of trees on the left with a barn in front and branch just after the barn. You need to be climbing towards a copse of trees. Pass through the trees and follow the path alongside a second group of trees coming out on to a road at SD 830653. 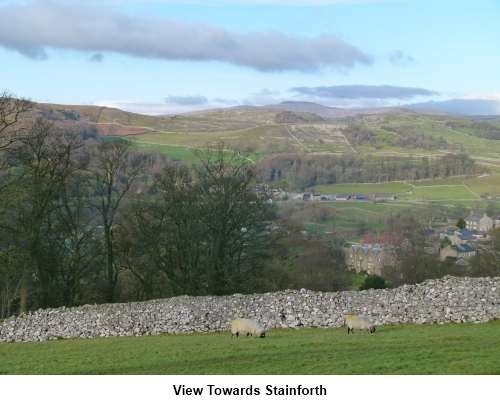 Walk straight ahead along the road for half a mile and after crossing a cattle grid, turn left following the Pennine Way bridleway fingerpost for Stainforth 13/4 miles down a tarmac track (SD 835660). Continue to a farm where you turn right, continuing to follow the sign for Stainforth. Follow the left hand wall of the field until the path opens out into a much larger area where the track meets another. Turn left. This goes to a gate in the left corner of the field (SD 832670). 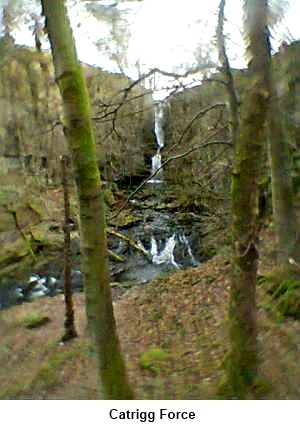 Through this and a second gate, you access the Catrigg Foss waterfall. Return through these gates afterwards and turn left. Follow the wall on the left then branch off right at a fingerpost at a ladder-stile for “Henside Road 11/2 miles”. Follow the direction of the fingerpost over the hill. On reaching the wall, turn left and follow it to the ladder-stile. After crossing the ladder-stile, the path is a little indistinct but head to the left of the dilapidated barn where there is a gated ladder-stile. Cross this and head to the road, just over 100 yards to the right. At the road, turn left (SD 848669). You now have about 1.3 miles of road walking but this is a quiet lane with good views across to Pen-y-Ghent and you will not meet much traffic. Ignore the left turn on a bend. As you arrive at a farmstead (Capon Hall) with Malham Tarn in the distance behind it, take the path on the right indicated by a fingerpost for “Langcliffe 3 miles” (SD 866667). The path curves clockwise from the road to a ladder-stile, passing under some power lines. The path is reasonably distinct and from the ladder-stile and keeps pretty much straight ahead until it joins a broad track. It crests a rise where there are some rocks with great views which make an agreeable lunch stop. The track bends to the left here and a few yards off the bend to the left is Jubilee cave. Not far after the bend, take the path on the left signposted for Victoria Cave (SD 837653). This is just off to the left of the main path. 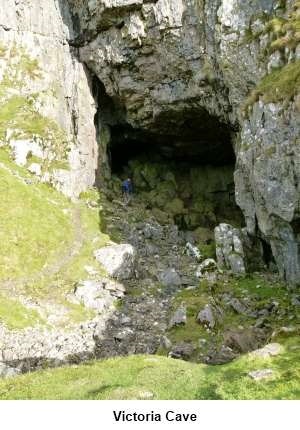 A notice board warns you that the mouth of the cave is unsafe and describes some of its history. Prehistoric remains were found there and it gets its name from the fact that an inner chamber was discovered on Queen Victoria's accession day in 1837. The path descends passing below Attemire Scar where there is a cave should you wish to climb the steep path to it. It is an interesting cave with a pool but to explore, you need a torch and a potholing inclination! Turn right at a broad gateway (SD 840642) and stay on the track below the Warrendale Knotts for a mile. You rejoin the broad track where you began. Turn left back to the junction with Highway (SD 823641) and the road back into Settle.